“Steve and Liv are some of the most amazing people I‘ve ever met. I have a lot of respect for them and admire their love, wisdom, and care in the way they approach their lives and others. They have adopted many children and fostered countless others. They have a wonderful, hardworking family with children ranging from age eight to the mid-twenties! Due to their family’s growing and changing needs, they decided it was time to make the move from the home they had lived in for the past 21 years. A home they had made dozens of modifications to in order to adjust to their family’s needs. They had previously purchased a horse hobby farm where they could support children in need through equestrian interactions. They determined that a move closer to the hobby farm would be the ideal next step for them. They had their eyes on a fabulous property adjacent to their farm that had come on the market recently, with 21 acres, some wooded, some wetland, and some usable. It was IDEAL for their needs! The house itself would need some remodeling and some bedroom modifications to work for their family, so that was a bit of a challenge, as was the initial asking price. Based on market data, it was evident that the asking price was not reflective of market value. We decided, however, to initiate conversations with the sellers via an offer that was much closer to market value than asking price (a significant difference). The sellers weren’t thrilled about the offer and responded by dropping the price a significant amount on the MLS, yet still far above market value and our offer. We continued some negotiations that ended at a bit of a standstill for a period of time. However, since our team has good ways of tracking market data, we were able to see that besides us, there weren’t other buyers looking at the home. Steve and Liv waited patiently, allowing the sellers time to understand better what the market would offer. 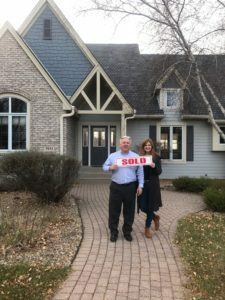 After a few weeks, the buyers decided to order a third party appraisal to get another professional opinion of the value, and the sellers agreed to allow it. Not surprisingly, the value came in much closer to our initial offer than anywhere near asking price. Having this appraisal, plus the power of it being validated by another third party appraiser, we resubmitted our offer along with the appraisal. The sellers took it seriously, reviewed it, and countered our offer. After more negotiations back and forth, we landed at a price that Steve and Liv felt comfortable moving forward with and we had a deal! Their final purchase price was 81% of the initial asking price and 88% of the price the sellers had dropped it to after our first offer.